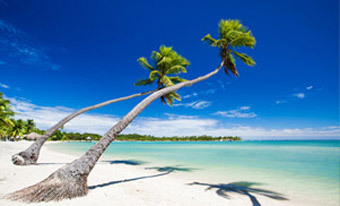 Fiji is a chain of over 332 romantic tropical islands situated about two-thirds of the way from Hawaii to New Zealand. Its friendly people and idyllic setting make it a tremendously popular leisure travel destination. With tourism being one of the largest industries in the Fiji Islands, Tourism Fiji sought to study its visitors by identifying key visitor groups and developing detailed trip characteristics and spending profiles from these groups. The marketing organization also wished to gather important data regarding how Fiji visitors planned and booked their trips in order to expand Tourism Fiji’s understanding of the channels and resources used in Fiji travel planning. Working closely with Tourism Fiji, Destination Analysts conducted this research through a self-administered survey of passengers about to board Air Pacific planes departing Nadi International Airport. Research staff distributed a brief survey to passengers on selected outbound flights, which were then collected as passengers boarded their plane. Given Fiji’s key regional markets, the survey was available in English, Chinese, Japanese, Korean, French, Spanish and German. During the research period, nearly 5,000 completed surveys were collected from Fiji visitors who reside in Australia, New Zealand, the United States, Canada, the United Kingdom, China, Japan, Korea, France, Spain, Germany and several other countries. The findings from this research provided Tourism Fiji with an understanding of the in-market spending patterns of travelers from key markets and by type of traveler, such as independent travelers and visitors who purchased a pre-paid travel package for their Fiji trip. In addition to identifying different marketing approaches based on country of origin and type of traveler, Destination Analysts was able to make travel spending comparisons between the different visitor markets and thus distinguish the visitor types with the highest economic yield to Fiji. Based on this data, Tourism Fiji made key decisions to reassess its marketing efforts and identify the most appropriate allocation of its marketing dollars.